A team of experts plates and samples every single dish before it is boarded. In this photo, Alaska Airlines onboard food and beverage product manager Kirsten Robinett plates a pasta dish in a recent menu quality check. A team of experts plate and sample every single dish before it is added to the menu. In this photo, Alaska Airlines onboard food and beverage product manager Kirsten Robinett examines a first class meal in a recent menu quality check. Pictured here: Cucina Fresca penne with herb-roasted chicken breast and broccoli florets. Let’s be frank. Meals don’t always taste so great at 35,000 feet. Taste buds are dulled and even the most carefully prepared dishes are, at best, reheated leftovers. It’s no wonder that airline food has a bum rap. But Alaska Airlines’ chef and a team of onboard food and beverage experts have spent the past few years working to change that. “We don’t want to just have good airline food – we want to have good food, period,” says Lisa Luchau, director of Alaska Airlines’ onboard food and beverage services. Members of the food and beverage team scour Seattle’s restaurants for inspiration for what’s hot in the local market. Then they take those ideas and figure out how to make them fly. Chef Joshua Rappaport has a background in classical French cuisine and has cooked in some of Seattle’s most elite restaurants – but the recipe for good food is a little different at 35,000 feet than on the ground. Researchers at the flight test facility of Germany’s Fraunhofer Institute for Building Physics have tested and validated this phenomenon. They say a person’s sense of taste at altitude is similar to their sense of taste with a cold. Salt loses 20 to 30 percent of its intensity, while sugar tastes 15 to 20 percent less intense. Flavor: Taste buds are dulled at cruising altitude, and simply dousing meals with more salt and pepper is not a great solution. Instead, Chef Rappaport looks to foods with acidity – citrus juices, vinegar, fruits like pineapple and mango – and flavorful spices like cumin and chili powder to add brightness and flavor without adding extra salt. A penne pasta dish is draped with fresh cabbage leaves to keep it moist until it’s ready to be served. Moisture: Moistness is almost as challenging as spice, says Chef Rappaport. The combination of reheated food with dry cabin air can result in food that’s either too dry or doused in sauces. To combat dryness, many airlines board food with a fresh cabbage leaf draped over the top. 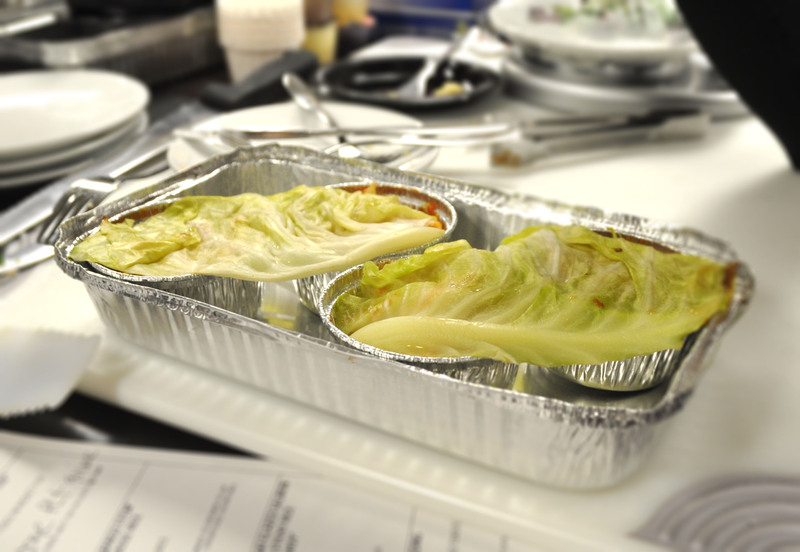 The cabbage helps trap the moisture as the food is transported, heated and served. 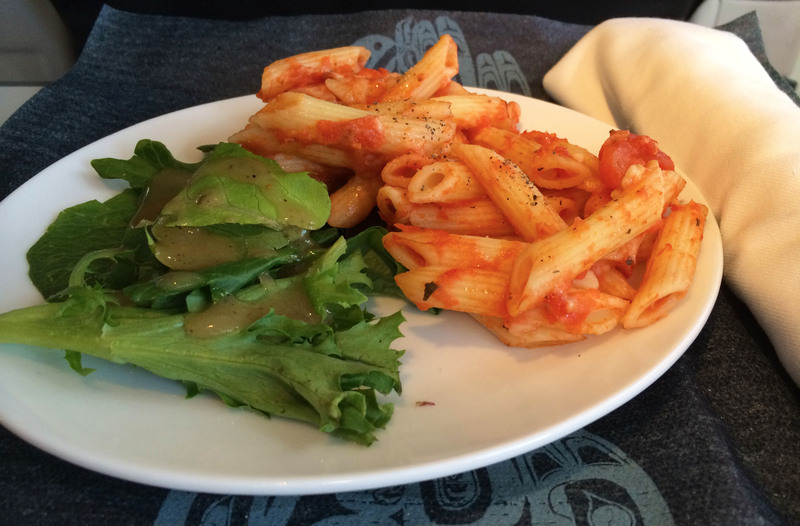 The same penne dish as served to a first class passenger onboard a flight from Seattle to San Francisco. Reheating: “I always say that airline food is actually the best leftovers,” says Luchau. Every dish has to be cooked enough on the ground to eliminate foodborne illness, but not so much that an extra 20 minutes at 275 degrees onboard will overcook it. That means every meal served onboard must be able to retain its texture and flavor through multiple reheatings. Packing: You might come up with a meal that reheats beautifully, but that is too complicated to plate with limited onboard equipment, or too heavy to pack. A dish that requires each element to be individually packed in a ramekin until serving, for example, is going to be too heavy and cumbersome to fly. One of Rappaport’s first class recipes includes blanching (immersing briefly in rapidly boiling water) fresh ravioli, then flash-chilling it and covering it with fresh cabbage leaves until it’s ready to be reheated and served – and that’s just to cook the pasta. Cubes of smoked mozzarella cheese melt over the ravioli as its reheated. Another, a Beecher’s Cobb salad shaker available to purchase on select routes in the main cabin, features applewood smoked bacon, grilled chicken, hardboiled egg quarters and generous crumbles of Seattle-local Beecher’s Flagship cheese. You may never look at a Cobb salad the same way again. Flying this month? Learn what you can expect to find on the menu. 11 comments on "Busting the myth of bad airplane food: Alaska Airlines chef uses science to make food fly"
In first class, I am always disappointed by the food. There is almost never a vegan option, except for the mixed nuts. I can’t even eat any of the packaged snack mixes as a vegan. I wish that in first class they would at least offer to give me one of the Mediterranean snack packs (which costs $6 in coach). I am an MVP gold member, and I would also like to see the option of being able to choose between an alcoholic beverage and a snack pack when traveling in coach. The snack packs cost less than some alcoholic beverages onboard, and not everyone drinks alcohol! Do you test the food in the air? according to the story on wine, food is supposed to taste different in-flight. Yes, our food and beverage teams do quality checks in the air as well as on the ground! Sounds like a cool job.How do they keep from getting fat? Please remove the Poached Pear in Red Wine Reduction dessert from your Lihue to Oakland and Lihue to San Jose first class menu. It is disgusting. The sauce tastes like cough syrup. Please give us another choice like a Dixie cup of vanilla ice cream or a cookie or ANYTHING ELSE. How about something Chocolate? I complained about this dessert 2 months ago and they were still serving it yesterday when my sister flew. You gave me a $50 Discount Code, which was kind, however I can’t use it with any other rewards program like Companion Fare or booking with air miles. Can I use the $50 discount code to buy a different dessert when I fly next month (Oakland to Lihue).? I wish airlines would also consider the digestive effects of their meals – I was glad to hear the cabbage leaf is just for reheating! On non-Alaska flights, I’ve been served way too many bean / legume / broccoli side dishes. I already get extremely bloated in the air, the beans make it 10X worse, so I often prefer to just go hungry. I think the onions / garlic used to strengthen flavors are another culprit. For the airlines that give us legumes / gassy vegetables: I eat these all the time on the ground, I know they are healthy and good, but this is one meal – give me something that won’t blow me (or my fellow passengers!!) up like a balloon! I’ve learned to watch what I eat and drink before and during the flight, and always carry gas-x or something similar on board, but it always seems really annoying when I’m served a nice portion of hummus or lentil pilaf. Enjoyed the cod on the return from ATL to PDX. Please keep this route going! The Beechers cheese and fruit is a definite hit – i purchase every time! The falafel, however, was a gigantic fail! Will certainly try that cobb salad! Just serve those small delicious apples…they were so delicious and refreshing many years ago when Alaska Air served them. Also, the prayer must be included again in first class. Those who were offended by prayer are known to be offended by everything except by themselves. I agree with the apples but not the prayer cards. If you are going to have prayer cards, you need them for all religions and different languages to cater to the diverse client base. Print out your own prayer card/download it before the flight.